It was cool out today, but sunny. I love to sit by the window and spin with the sun coming through the window on my back. Tomorrow by 4, the temperature is forecast to get up to 75 and maybe up in the 80s late in the day on Wed and Thursday. You people in the sunbelt have no idea how wonderful that sounds to those of us with webbed feet. I will take my knitting outside (when it warms up) and soak in as much sun as possible. 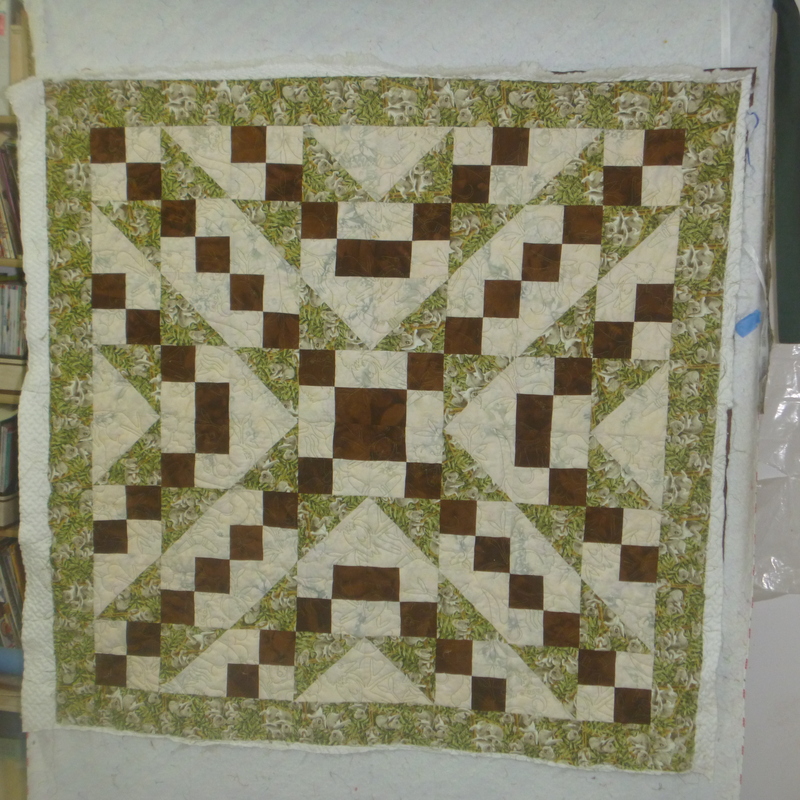 Here is the Koala quilt that I quilted today – It is only 48″ square so wheel chair or child sized. It has been waiting it’s turn. 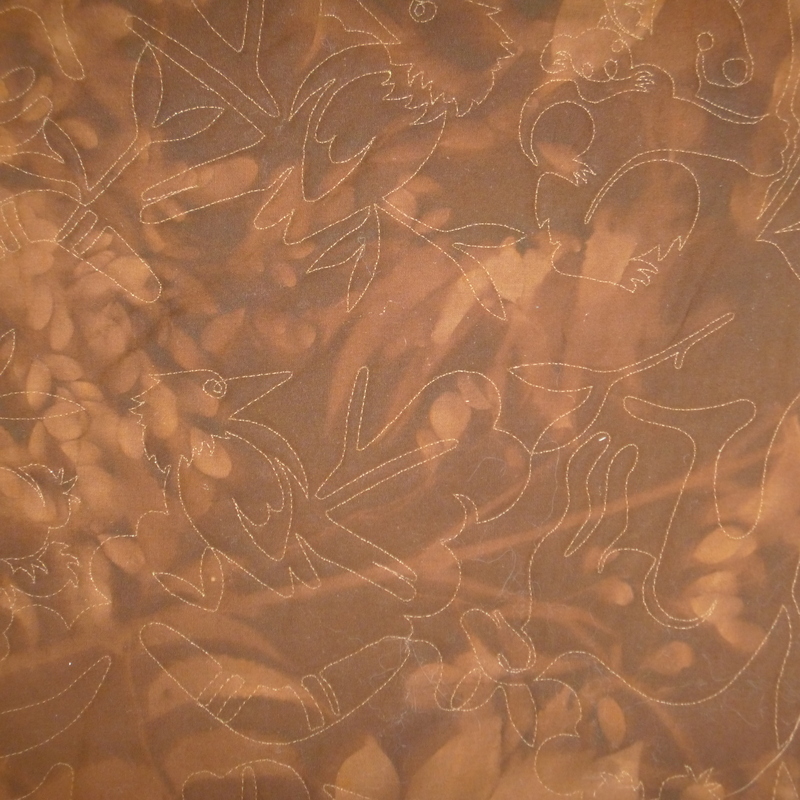 Here is the back, perhaps, if you enlarge it you can see the design of Australian wildlife. This back is the same dark brown as the front, but the flash changed the color. It still needs trimming and binding. I have been asked how I get so much done. First, it doesn’t seem to me that I do. But I do push myself with lists and stern talking to get something done daily. Today, after spinning most of the morning, then winding two hanks of yarn into balls, we ate a quick lunch and went to get some more beekeeping supplies. We came home and I did the quilt which took 4 hours (but a lot longer working up to getting it done including deciding on the pattern) . Then a quick trip to gather eggs and pen the animals (no choice there). I convinced myself that whatever spray paint I could find in the garage would work just fine for the bee box I need tomorrow. Chalkboard paint was the only thing I could find, so used it. I now have several white bee boxes and a black one. In this case, done, was better than waiting to buy white paint as I need to give it to the bees tomorrow after it warms up. There are 3 more to paint and I will buy paint before I need them. Supper was left overs from other meals this week, so just had to warm them. As you can see, I do what matters carefully and the other as quickly as possible. Tomorrow, I have a morning appointment, after which I absolutely must fertilize the plants in the greenhouse. (Many things get done out of last minute necessity) If I get up early enough, I’ll get some sewing in, but I’m not counting on that happening. I will attend to the bees in the afternoon which will take an hour and then enjoy knitting a new pair of socks in the sun and taking a walk. Housework is only done under duress or when company is expected. Unless, it really gets to me, then I’ll take the time to take care of the issue that is bothersome. Most things get done on the way to doing something else – such as taking laundry to the machine on the way to breakfast. A couple mornings a week are spent preparing food for the week. Now it is 9 PM and I’m collapsing. At 6 I’ll start this all over again. I’m never bored and I hope you enjoyed this small look into my life.